I’ve been making soap since 1998. What originally began as a “cute idea” got under my skin and now I am hooked! Even now, after thousands of bars of soap, I look into that soap pot and feel a new sense of amazement that it really, truly, and actually is turning into soap right before my eyes. It all started when I moved to our family ranch. Once my daughter and I arrived, I started looking for ways to support myself. I wanted to do something that was somehow related to the land, so I started researching different types of “homesteading” activities. Animal husbandry was out because I didn’t really want to raise and then sell or kill animals every year. Plant crops seemed like an awfully lot of work. And besides, I didn’t really have the skill set for either activity. Weaving never really interested me. Quilting didn’t seem like it would produce sufficient income. And then there was soapmaking. There was something about the idea of soapmaking that appealed to me. I’d never made soap – didn’t even know that you could make soap until I started reading up. But I just kept coming back to it. Then I read that the earlier soap makers were called “Soap Chandlers”. Hmmm. My maiden name is Chandler. I had moved to the Chandler Ranch. The epiphany came – I’d go for soapmaking and Chandler’s Soaps was born. Taking the plunge, I bought enough oils and lye to get started. After that very first batch (which was pretty hysterical), I was hooked. Shortly after I made my decision to make soapmaking my new career, my niece Shelly got a divorce and needed a retreat for herself and her two young girls. So Shelly, with daughters Sabrina and Sarah, arrived at the ranch and Shelly became a partner in Chandler’s Soaps. Together Shelly and I learned soap making. We studied books, bought and experimented with ingredients, forayed into the growing world of internet soap making sites and gradually became pretty good soapmakers! That first year we sold our soap at local craft shows, to family and to a few other customers from word of mouth. I thought we had discovered the newest, greatest, big idea! It was at one of those craft shows that I met someone who mentioned there was a Guild for handcrafted soap makers. I was stunned to learn that there were enough handcrafted soapmakers to create a guild! 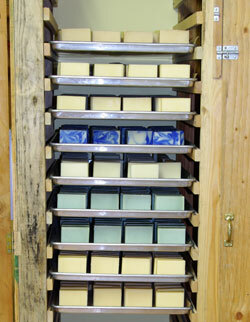 Shelly and I went to the 3rd Annual Conference of the Handcrafted Soap Makers Guild in Hood River, Oregon in 1999. It was terrific and inspiring. My soap making skills increased and we added different kinds of soap to our product line. We also discovered creams, lotions, body oils, and other products that used the same ingredients. More expansion (maybe too much expansion) ensued in 1999. During that time a marvelous man entered my life. He also happened to be a website designer, so the first website for Chandler’s Soaps was launched in 1999. In mid-2000 Shelly decided that it would be best for her and the girls to get back to “civilization” so she moved back to Seattle. I was sorry to see her go. In 2001 I built a small workshop in which I make my soap. In 2003, I opened a small store in downtown Myrtle Point, Oregon. We sold products retail and used the back for shipping orders from ForSoapmakers.com (my business selling foam pump bottles and malibu tubes … that’s another story). It was also in 2003 that I was elected to the Board of Directors for the Handcrafted Soapmakers Guild. In 2004 I took over as President, a position I held until 2009. Over the years I’ve developed a range of products and standard formulations that I am very happy with. I’m still working to improve my packaging and marketing, but the soap itself is (if I do say so myself) really excellent! I use it for everyting – my face, body, feet and hands, kitchen dishes, laundry, washing the horses and dogs, and even cleaning the car! For a discussion what soapmaking is all about, see The Art & Science of Making Soap For pictures and an explanation of the soap making process, see Making Soap. Over the past 10 years my interests have shifted a bit and my body has gotten older. I now find it more enjoyable to write about soap and help soapmakers through the Handcrafted Soapmakers Guild (changed to the Handcrafted Soap & Cosmetic Guild in early 2013), website design and my books than it is to lug and tote 50 lb boxes and buckets of oils and to wrap and pack thousands of bars of soap. Don’t get me wrong, I still love handcrafted soap and am amazed and awed every time I make a batch! But I’m paring down, working toward simplifying my life and not being so hard on the old body. So Chandler’s Soaps is closing down … I’ll make soap for friends and family, but not for commercial sale.